It was the second week of our summer program, and it was awesome! Between tending the garden and youth farm, running our camp for elementary through high school age kids, cooking, learning to grant-write and canvass, Katie’s skill-share on making your own cleaning supplies, biking our produce to MOM (Middleton Outreach Ministry Food Pantry), and our community work-day, it was a busy but fun-filled week. 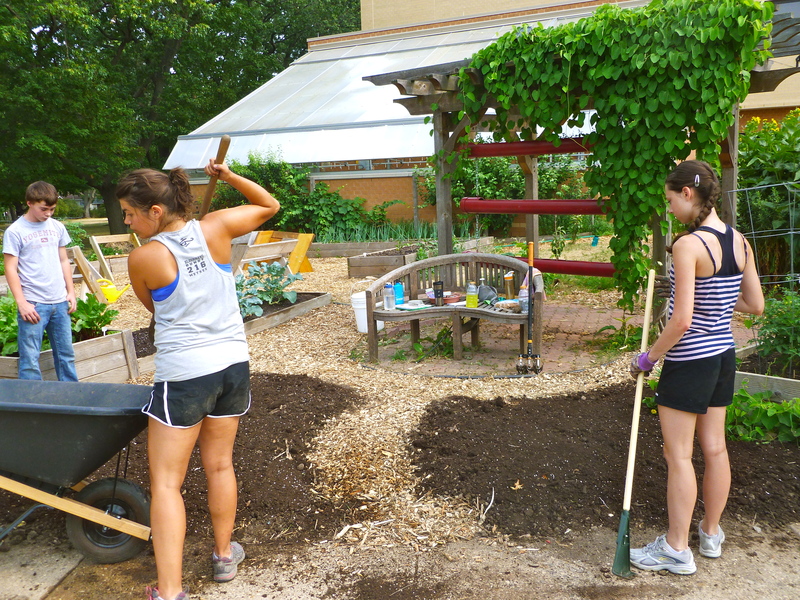 We spent Thursday cleaning up the front of the high school garden. Before we set to working on it, it was overgrown with weeds and looking pretty miserable. We did some major weeding, and designed an awesome new area where we planted lupine and three varieties of sunflowers (that will grow 2 ft, 7 ft, and 12 ft tall!). It was a crazy hot day, but our hard work totally paid off. Along with the awesome red PVC pipe planters we hung up last week for the herbs, the garden area is looking beautiful these days. The highlight of my week, which may sound a bit morbid, was killing bugs. Japanese beetles have basically been attacking the youth farm. Their favorite plants to munch on seem to be the potatoes and beans, but they have proven themselves to not be picky-eaters. We have found them on the tomatoes, kale, broccoli, and more. On Friday, we decided something had to be done. 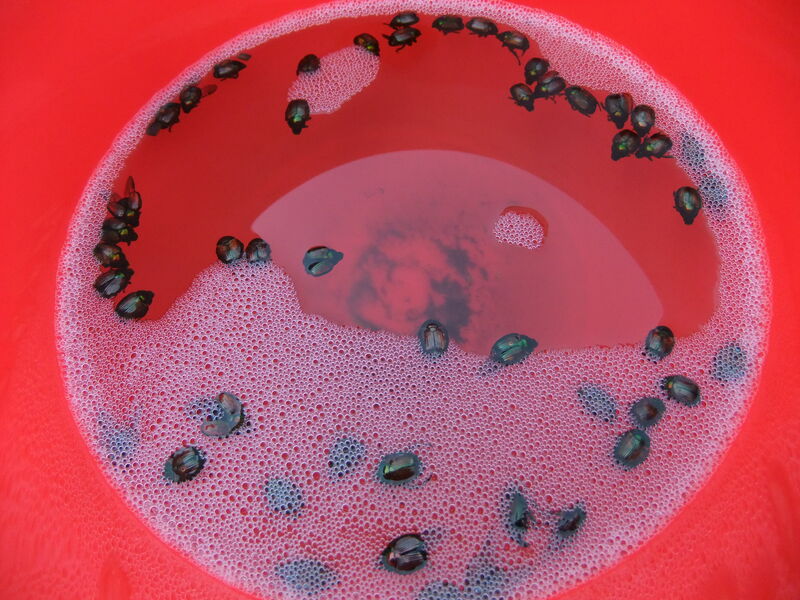 We grabbed a bucket of soapy water and the helping hands of the kids in our program, and set out to capture those critters. It was quite a sight – about ten of us, running/sneaking around the farm to hunt down the evil beetles, and throw them in the bucket. We were all on a mission together to save the youth farm from the ensuing invaders. In the midst of all the craziness, it was a great bonding moment for us and our high school participants. At our weekly meeting later that day, it came up as a highlight in a number of people’s weeks. Another highlight for me was our Saturday community work day. Every Saturday we have a community potluck from 12PM – 1PM and a community work day from 1PM – 4PM. Thus far we have not had much time get the word out, so it has mainly just been program participants. Recently I have been telling my friends all about the awesome stuff we’re doing here at Growing Food & Sustainability, and have been encouraging them to come out on Saturdays to see what I’m talking about. I was super excited when seven of my friends showed up to volunteer this weekend. 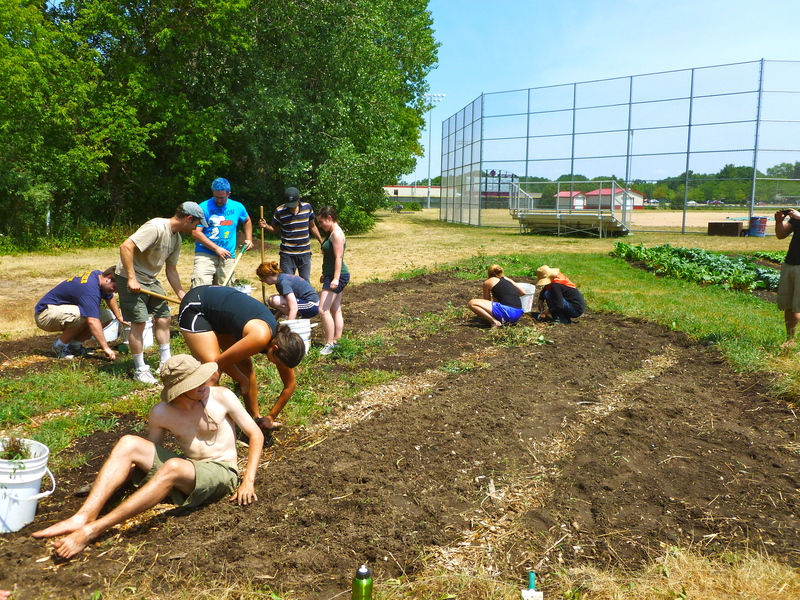 We got to work right away, weeding what we call “the triangle”—basically a triangular patch on the youth farm which had never been weeded. The job seemed overwhelming at first, but with our manpower we were able to clear out the triangle in no time, and even begin transplanting our squash! We even had time left to weed the rest of the farm, water everything, and go on a Japanese beetle killing spree. It was great having so many of my friends out to support our program. In future weeks as we continue to spread the word about our community work days, I hope we will have many more people join us out on the youth farm. Overall, it was a very productive week. It was encouraging to see our garden and farm transformed by all the weeding, planting, and bug-killing we did, but also to see friendships strengthen and grow as a result of working alongside one another for the sake of sustainability. Bring on week 3!